This 1930's activity book has entertaining activities for anyone born in the 1930's. It has puzzles and games from the 1930's. There are also fun activities for seniors that they can do by themselves if they live alone. This 1930's activity book measures 8 1/2" x 11", comes in standard size print, has 48 pages and a soft cover. It displays important people & occasions that took place in the 1930's. 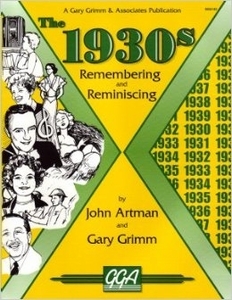 It contains mini biographies of important people, 1930's fact word searches, trivia scrambles, facts like inventions and new products, music from the 30's, fill in the blank activities, historical events and information, and other fun activities. These 30s activitiess will bring back many nostalgia from that era. There is an answer key included at the back of the book.